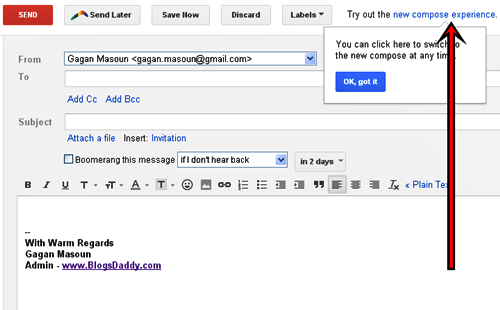 Home » gmail » Internet » Social Network » How to switch back to old Gmail Compose? 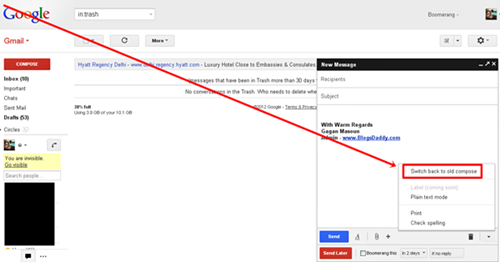 Last year in October 2012, Google announced and makes its Gmail new compose window default for everyone and confirmed in hands with TNW that eventually the new compose will fully take over and the old compose will no longer be available. It has been updated according to the user’s feedback. Most changes don’t need explanations but some differences are worth noticing and here is what you have to notice. What’s new in Gmail Compose? What are you missing about Old Compose? You appreciate distraction free, multiple composing option but you are missing more room to write. The new reply window scales the content inside to allow you to see. It doesn’t play nice with all the labs, if you have activated a right hand chat, a popular-app for those who want to reduce mess, you are badly going to miss Old Compose because new emails are going to cover the entire chat columns. You are losing chat window if you are a heavy chat user though you got new pop-out replies option, because New Compose doesn’t clean up the bottom of your Gmail window, if you have too many windows open and minimize for sure you are going to miss one. You are confused though you appreciate clean window to work on, but its irritating that you can’t find a right tool that could change your front, colors or edit the subject because new Compose has hide and minimize the designs. When you composed a mail and before sending the mail you want to add a file, when you done searching for it and the moment you want to have it in the mail you just made, a NEW mail window pops up with the file in it! That means you can’t add the file in the first mail you composed. You miss to check how long it’s going to take to upload a file as new compose do not show how much you done attaching your file. You miss sending professional e-mail through that small pop-up window. How can you can you switch back temporarily? 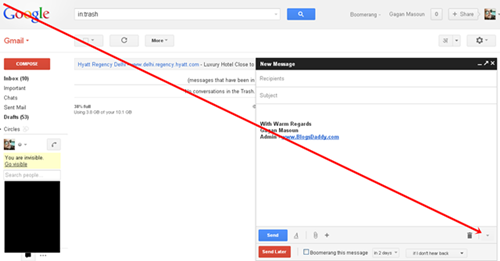 Click On The Red "COMPOSE" Button So The New Compose Email Pop-Up Window Opens. Its Done! Welcome Back To "Old Compose"
How to again Enable the new compose box? It is very easy process, but if you need our help you can ask via comments.Note that Google will eventually make the switch to the new compose for everyone. Even if you opt out now, you will have to upgrade eventually.